Maroon 5 in Concert on September! Who wants to see the The Voice judge perform with the rest of Maroon 5 again on September 18, 2012 here in Metro Manila? 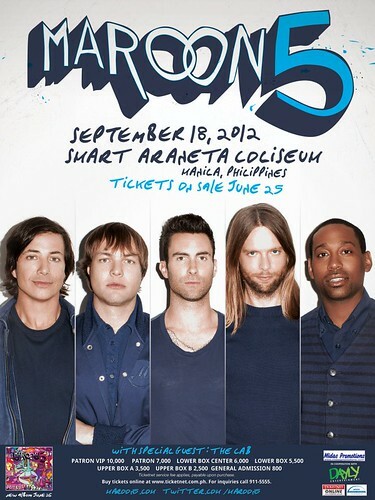 Maroon 5 is probably one of the big acts to perform here, and they will do so at the Smart Araneta Coliseum. Ticket sales will start on June 25, and can be bought online at Ticketnet or call Ticketnet hotline 911-5555 for more details. Maroon 5 live in concert in Manila?! WOW! Its great such big and famous bands visit even destinations so far away from their homes. That proves how devoted to their fans they are.